Atkins founded Atkins Nutritionals, Inc. in 1989 to promote the low-carbohydrate products of his increasingly popular Atkins diet. This diet was developed after Atkins read a research paper in the Journal of the American Medical Association. Thinking about trying Atkins Shake to help you slim down? This in-depth review will get you up-to-speed on this time-tested, popular diet plan. Atkins shakes come in both protein powder and ready-to-drink form. Whereas the powders come in just milk chocolate and vanilla, the ready-to-drink versions have much more of a variety. These come in flavors like chocolate banana, café caramel, dark chocolate, mocha latte, strawberry and more. 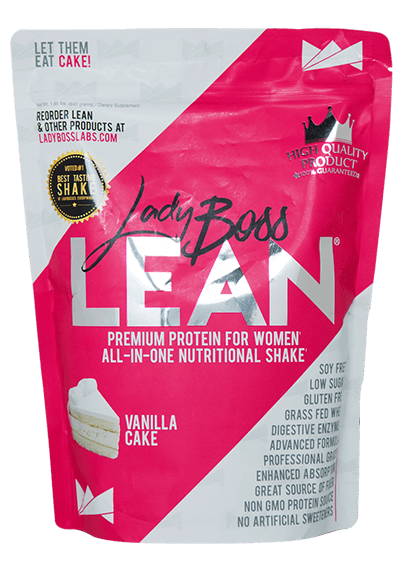 Starting with the calories, this shake is right on target with 100 calories per shake serving. Many meal replacement shakes are loaded with calories (and are high in sugar, carbs and fat), but Atkins keeps their calorie count at a decent level. 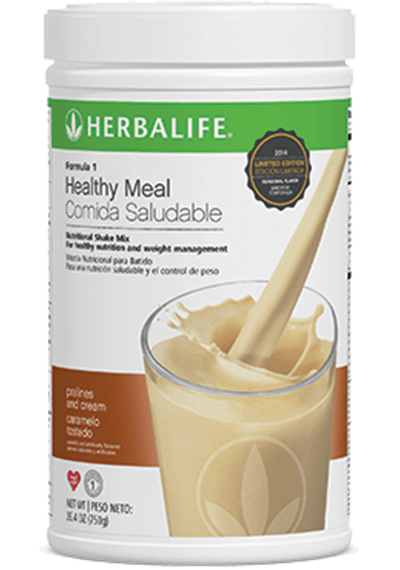 Why do you want a shake with around 100 calories per serving like this one? Flexibility. 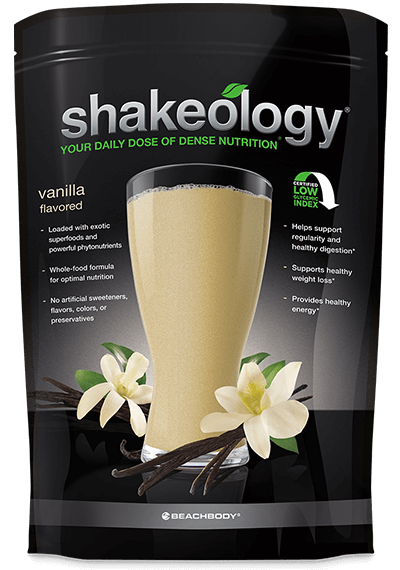 This allows you to add more healthy ingredients into your shakes. And, if you’re trying to lose weight, it can help you get there faster. 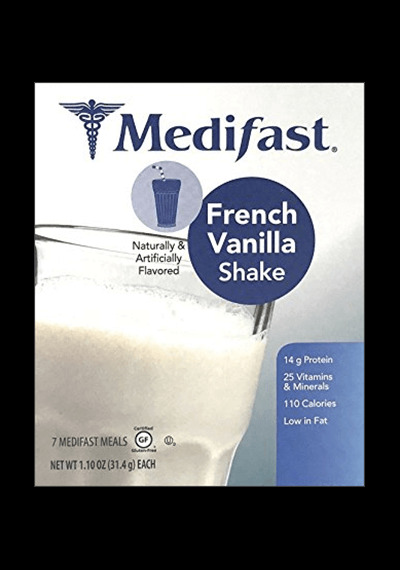 As long as you’re getting a variety of healthy nutrients in the shake, 100 calories per serving is a great start for a meal replacement formula. Next, let’s look at how much protein is in each Atkins French Vanilla Protein Shake and where it comes from. Starting with the serving size, there’s 15g of protein in each scoop of an Atkins Shake – which is an ideal amount. Protein is a cornerstone in an effective meal replacement shake formula. If you have too little, you don’t give your body what it needs for fuel and to maintain a healthy weight. Adequate protein not only keeps you full after a meal, it helps boost your metabolism and supply you with needed energy. It also assists with building lean muscle and for stamina while exercising. 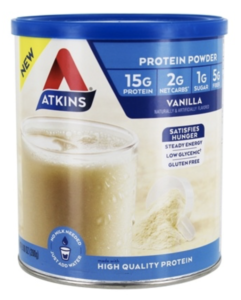 The problem in the Atkins shakes comes from the source of the protein … it’s a blend containing soy protein isolate. The other problem is that 90 percent of the soy used today is genetically modified (90 percent)! Genetically modified (or GMO) foods come with their own host of potential health problems. This is mainly because they destroy the good bacteria (probiotics) in the gut, negatively effecting immune and digestive health. Organic soy is the only safe bet to be non-GMO, since there are no harsh chemicals, fertilizers or pesticides used while growing. The problem is that most of the soy used in products today is not organic! 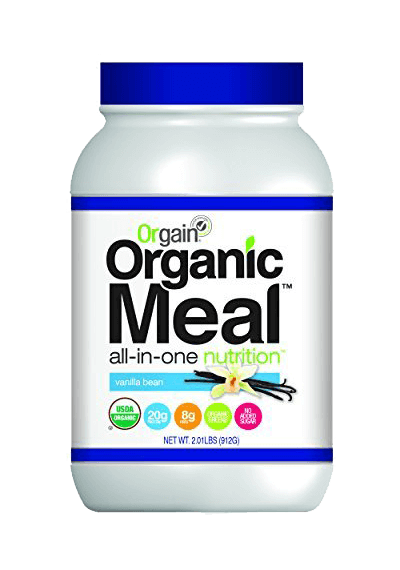 And this is the case with the Atkins shake since the label does not say organic. Since there is still no much unknown about the potential negative health effects of consuming soy on a regular basis, we believe it’s best to avoid this protein, especially since there are so many other nutritious options. Moving onto fiber, we see 5g of dietary fiber per serving, which is great. Fiber is needed for proper digestion, and to help your body burn fat. It also promotes optimal colon health by supporting regularity. It also helps to keep your blood sugar levels stable and prevent spikes and crashes. The problem is that it’s far from natural (it starts with corn syrup), and therefore can cause some unpleasant digestive side effects such as bloating and gas. It can also spike your blood sugar (the opposite of what you want to do), and disrupt your gut bacteria, weakening your immune system. Finally, unless specified, you can bet that SCF is made from GMO corn, going back to the potential health issues of GMO foods. The bottom line is that a meal replacement shake is something you’ll be drinking one or two times every day, and the less processed the ingredients, the better. 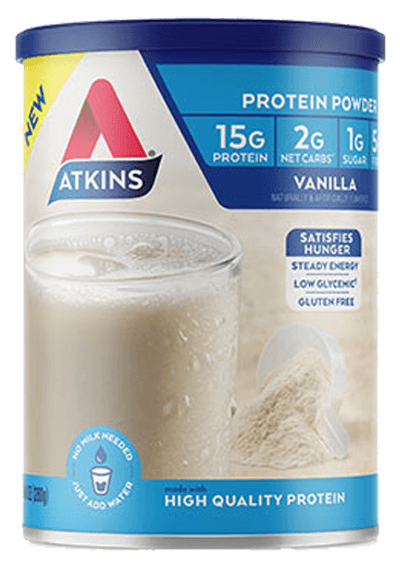 Obviously, since this is an Atkins shake which is part of the Atkins low-carb diet, it offers low-carbs at 7g per serving. The label also tells you the amount of net carbs that you receive in each shake. 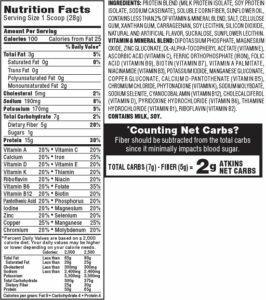 You get net carbs by subtracting the fiber (5g) from the total amount of carbs (7g) to get 2g of Atkins net carbs. Next up, sugar. The ingredient you definitely don’t want in any type of healthy lifestyle shake. First the good news… Atkins Shakes only contain 1g of sugar per serving. This is obviously great for low-carb and low/no sugar diets. The problem is that instead, they use the artificial sweetener, Sucralose, to sweeten the shake. Studies show that not only might artificial sweeteners be bad for our health in the long-run, but they can also contribute to weight gain! In addition, artificial sweeteners don’t give the brain the same “reward” sensation that eating regular sugar does. And our bodies simply aren’t as satisfied, so we just may end up eating something else that actually has real sugar in it later. We’ll tell ourselves it’s okay, because we “skimped” on real sugar earlier in the day! In this way, artificial sugars can actually cause us to eat an unhealthy diet while thinking we are eating healthy! Each Atkins Shake contains 24 vitamins and minerals, all at 20% of the daily recommended serving or higher. 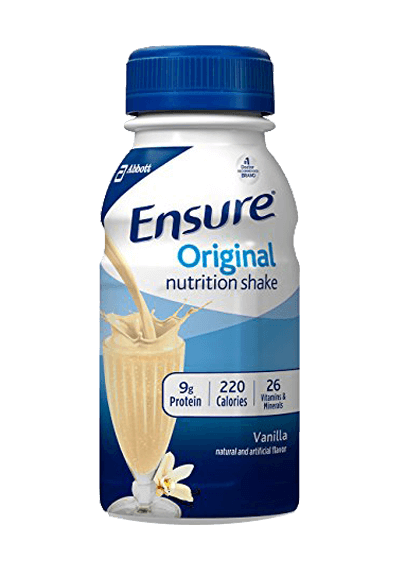 Since these shakes will be replacing meals, it’s great that there are essential nutrients in every serving to give your body what it needs. However, there is a big difference between the Atkins Shakes and healthier shakes in the market that also include a long list of superfoods. 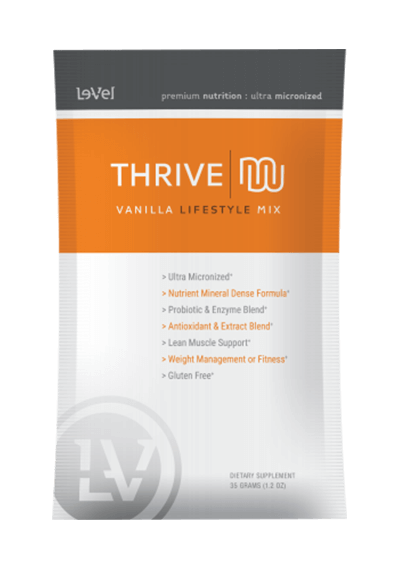 These may include organic fruits and veggies, herbs, digestive enzymes and probiotics for gut health. A shake that has additional superfood ingredients will provide more antioxidants and other immune-boosters for increased wellness. 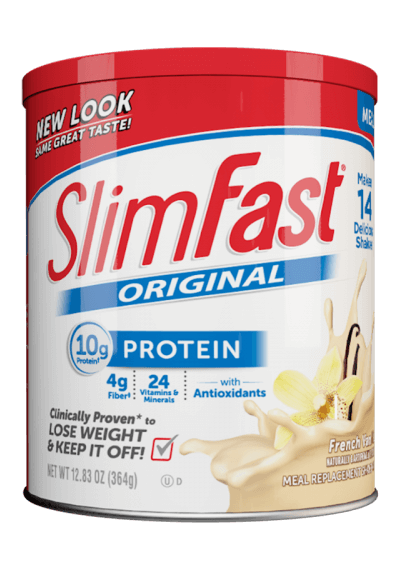 The bottom line is that the Atkins shake may be a product that can help with weight management for the short term, but it probably isn’t the best shake option for the duration. This is because it doesn’t provide any extra health-enhancing ingredients. Atkins was started by cardiologist Dr. Robert Atkins 45 years ago, yet this low-carb diet is still popular today. The Atkins diet, according to the company, focuses on eating right, not less. Atkins is based on the premise that when there is too much sugar in the bloodstream, your body stores it as fat. And even complex carbs can have this effect. The Atkins diet is intended to satisfy the body while creating greater energy, higher metabolism and less stored fat. Along with Atkins protein powders, the company also offers ready-to-drink shakes, meal kits, Atkins protein bars, Atkin meals, frozen foods and Atkins snacks. All of the packaged products are meant to be aids in following a strict low-carb Atkins meal plan. The company also offers a section on Atkins diet recipes on their website, including the best foods on the Atkins food list. This makes it easy to stick with the Atkins diet plan and not fall off. For instance, in the Atkins diet phase 1, things are pretty strict, and you can only eat 20 grams of carbs per day for two weeks. Atkins products make it possible to stay true to the plan on a busy schedule. You can contact the Atkins team by phone or email by filling out the form on this page. You can also download a quick-start kit from the same page. Atkins does allow returns (just follow the instructions on this page), although they do not mention how long you have from the date of purchase to return an item. They don’t process exchanges, though, so you would have to return one item and then order another. 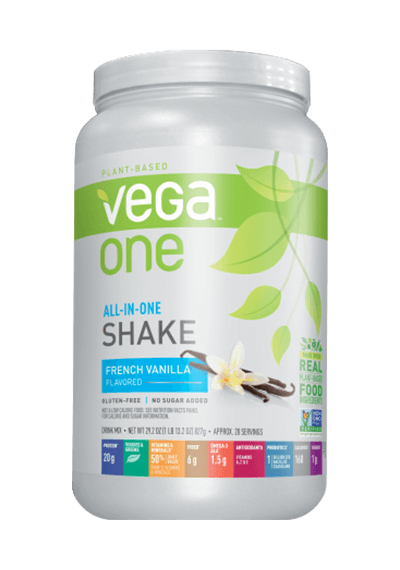 On the Atkins website, the price of one shake canister (20 servings) is $13.98 (or 70 cents a serving)! They also offer a 3-pack of canisters for $38.94. 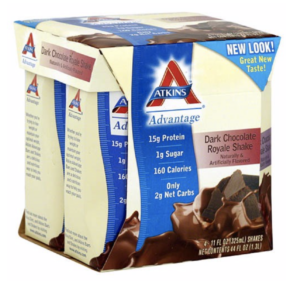 While Atkins shakes may be affordable, a quick glance at the label shows they use some cheaper, lesser quality, and controversial ingredients. In this review, we touched on soy, maltodextrin and Sucralose. 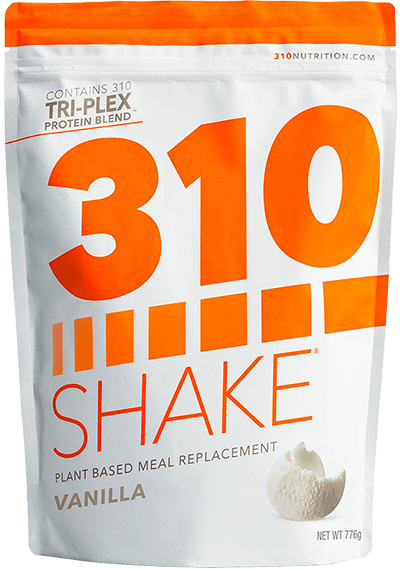 It’s also not a long-term health shake by any means… in contrast to our #1 rated shake, 310 Shake, which has an economical price and high-quality, nourishing ingredients. All of this being said, if you’re following a low-carb diet, the Atkins shake has some desirable traits. It’s a quick and convenient way to have a meal on-the-go while sticking to your diet plan. 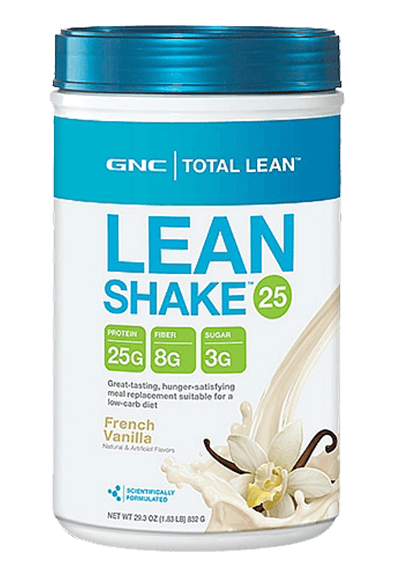 The shake has low-carbs and only one gram of sugar (but don’t forget about that Sucralose, which may actually make you eat more sugar/calories later on)! Atkins Shake reviews are mixed on the taste of these shakes, but a lot of people seem to enjoy them. However, we were less than impressed with a lot of the ingredients. Soy protein, soluble corn fiber, sucralose… Sure, these are “acceptable” ingredients, but they certainly aren’t the best ones out there for you. 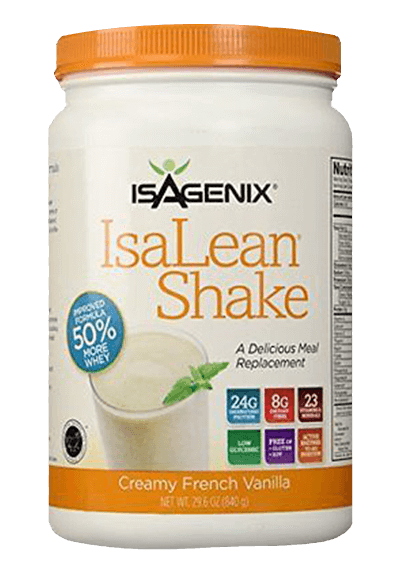 Before you pull the trigger on which meal replacement shake to try, check out the other reviews on this site so that you can make an informed decision! 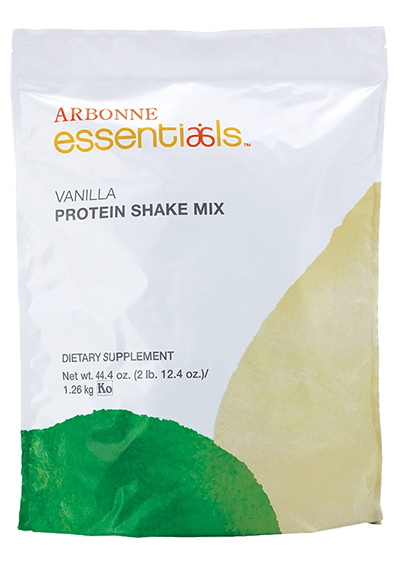 1Nutritional information from https://www.atkins.com/products/atkins-shakes/shakes/vanilla-protein-powder. 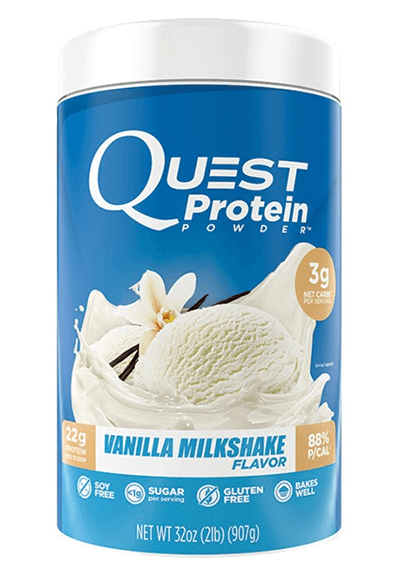 Price per serving calculated from a package price of $13.98 for Vanilla Protein Powder with 20 servings per package. Accessed 12/03/18. BBB Rating accessed 1/24/19. 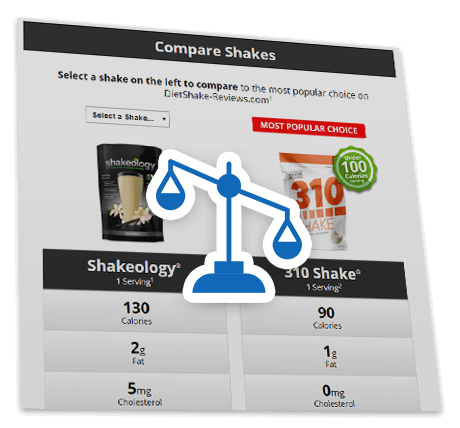 DietShake-Reviews.com does not include all shake or meal replacement products available to consumers in the marketplace.